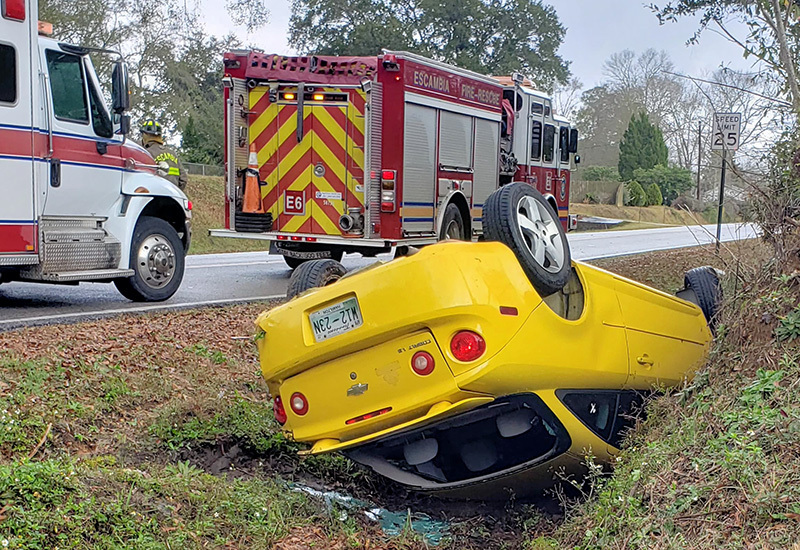 A driver escaped serious injuries in a rollover crash Saturday morning in Cantonment. 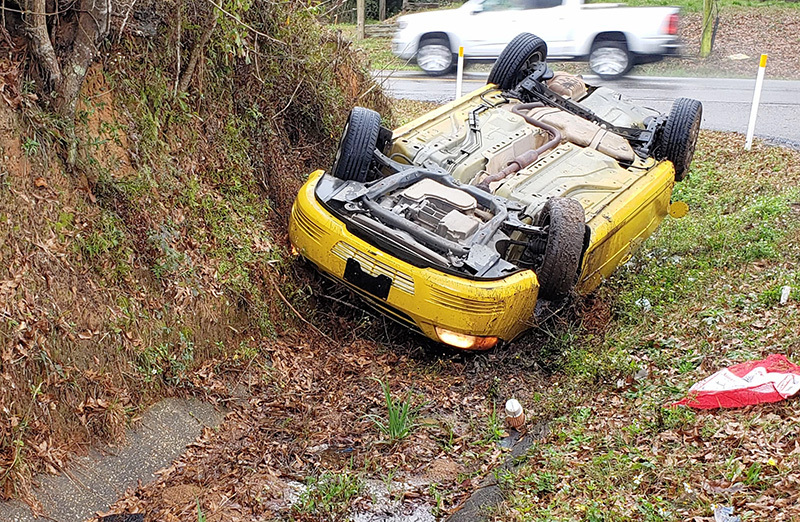 The driver of a Chevrolet Cobalt lost control and flipped into a ditch at Tate Road and West Roberts Road. The 23-year old female refused transport to the hospital by Escambia County EMS. The crash is under investigation by the Florida Highway Patrol. Escambia Fire Rescue also responded. @Pat You were not there and therefore cannot speculate on why my wife crashed. Furthermore, there are several yellow Cobalts in the area, so do not asssume that this terrible driver you’ve claimed to have seen was my wife. For the record, my wife crashed because she was turning in the rain and it was very windy. @John—Been there done that on my cell phone small screen. Didn’t mean to make a big deal out of it, but it could matter if someone was doing a search & using the wrong spelling. Good grief people, who in world cars about the model of car???? Seriously? There’s no need to debate that on here. A person was fortunate enough to walk away from an accident which clearly she caused. I’ve seen her around here. She flies down the road and usually on her phone. Way too many people are distracted by their phones these days. It’s crazy out here. Be on the defensive when driving. It may save your life! Stumpknocker- the one under the mobile home was a duo!! @John—It is NOT “Cobolt”. It is “Cobalt”, with an A. I used to have one. A very nice car. I owned 4 over the years, & my last one was yellow. I believe they were originally called a Cavalier. No, it didn’t, but the question wasn’t why this specific rollover happened but why they are so common. I don’t know what all caused this one but do know part of why most happen. I think the light weight of some of the cars and the speeds driven – particularly when the roads are wet – also plays a factor. I’m amazed at the number of people I see screaming down the road when it’s wet. It’s like somewhere along the way we have lost the idea that if it’s wet the car will slide and that you need to slow down a little and allow longer distances for braking. In my humble opinion, David clarifies and makes the stories more interesting by adding his comments. I love his intelligent input! Actually I don’t. You just remember when I do. Narrower and shorter still applies. Here are the 10 SUVs and trucks that presented the highest risk of tipping over on the road. Given the right circumstances, any vehicle can roll over. However, taller, narrower vehicles such as SUVs, pickups, and vans are more susceptible than traditional cars are because they have a higher center of gravity and thus are more top-heavy. She may have simply lost control in all of the high winds and driving rain this morning. Once she slid onto that ditch embankment, the roll was inevitable. I’ll be gracious and give her the benefit of the doubt. Too much cell phone use and not enough attention to the road and traffic. I hate to look in my mirror and see the driver behind me staring down at their phone. If I do see them I’ll do my best to get away from them. David Huie, Yep, you are right. I didn’t think about that. I have a Nissan Envy van that is very tall, and today was such a windy day, you certainly can feel that wind slamming on the side of the van. It does, however, do pretty good in high winds. SUVs have high centers of gravity, are more narrow, and shorter. They are inherently prone to roll over. I agree what is the deal, hitting poles going under mobile homes flipping over? What’s with all the roll over accidents lately? Praying the driver is o.k. And Please, don’t blame the roads. It’s the drivers.